I chose yellow because she loves sunshine and because there are two yellow picture frames in her dining room. I chose text fabric because she reads everything, even cereal boxes. I wanted something graphically straightforward and you can't get any more straightforward than a square and a triangle. I love seeing the parts of a quilt accumulate. They seem to embody limitless possibility. 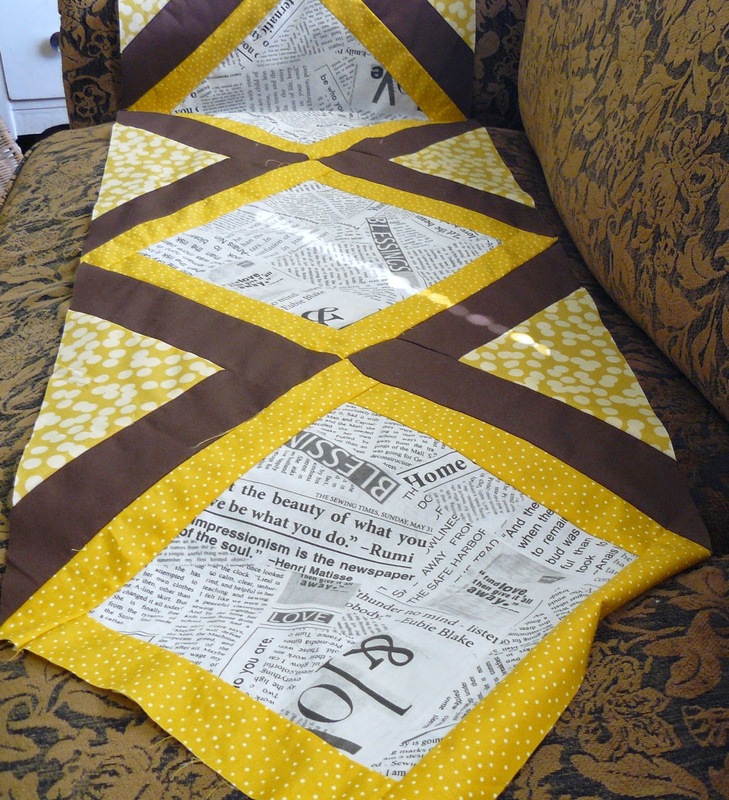 My mom has never seen text print fabric and was repeatedly concerned that 'someone was sewing with pieces of newspaper.' Just didn't seem sensible to her at all. Is it just me or can you see a diamond back snake if you squint. Sure hope it's just me. The backing fabric became kind of a big deal. The backing and the top need to see eye to eye. They need to be on speaking terms. Well, really more than that don't you think? They need to be friends. Speed dating was involved but at last......a perfect marriage. The backing I chose at length is hoarded fabric from Ikea. I bought enough several years ago to back a quilt for a grandchild. For several grandchildren. And likely for a couple floor length curtains but it was still hoarded fabric. Abundance and hoarding are not necessarily mutually exclusive. As always, I followed Lynne Fanthorpe's quilting advice, "If you can't see it, why do it." I think I'm in love with the back of this runner. Oh those birds! I bound the runner in the same backing fabric to bring the 'light' out to the edges. I was going for wood grain in my quilting but I think it has more of a Hell's Angels flame vibe. Did I tell you I love birds? Did I mention it is a veeeery long runner? Well, then, there is nothing more to add. is that mine??? I love it, I knew leaving the fabric choice to you was a good idea!